Glaucoma is a disorder associated with pressure in the eye, and is characterized by damage to the optic nerve, with consequent visual loss, initially peripheral, but potentially blinding if relentlessly progressive. Unfortunately, glaucoma is usually a disease in which the patient is entirely asymptomatic (without symptoms) until late in the disease. The disorder we refer to as glaucoma, is not a single disease, but rather a myriad of diseases with one final common insult, injury to the optic nerve. Glaucoma affects 2 million Americans, and half of those people are unaware they have the disease. Approximately 5 to 10 million Americans have elevated eye pressure, which places them at risk for the development of glaucoma. Eighty thousand Americans are already blind from the disease. African-Americans have a five-fold greater risk of developing glaucoma and, in this population, it is the single most common cause of irreversible blindness. Glaucoma is not usually diagnosed on the initial exam, and certainly cannot be determined by measuring eye pressure alone, regardless of the pressure. In general, the diagnosis of glaucoma implies optic nerve injury and loss of peripheral vision. Patients with increased eye pressures only, are said to have "ocular hypertension," or possibly are referred to as "glaucoma suspects". On the initial evaluation, most ophthalmologists will obtain eye pressure readings and complete a dilated eye exam in which the optic nerve is carefully evaluated. An enlarged depression (called a "cup to disc ratio") in the optic nerve may be indicative of glaucoma. If the ophthalmologist is concerned about the possibility of glaucoma, the patient is scheduled for a visual field test. This is a computer-assisted test that evaluates a patient for subtle peripheral vision deficits. Some patients believe, when they are told they need a peripheral vision test, that their peripheral vision is "fine" because they can see their waving hand off to the side. In reality, this kind of testing is so gross as to be entirely useless except in end-stage glaucoma or certain stroke patients. If peripheral vision deficits are found on the visual field test that are consistent with glaucoma, the patient will be informed and further evaluation scheduled or a treatment plan discussed. Many ophthalmologists recommend two or three baseline pressure readings prior to initiating treatment. This helps the ophthalmologist to gauge the pressure reduction once treatment has begun. Our office also uses Ocular Coherence Tomography (OCT) to help diagnose early glaucoma. This instrument measures the thickness of the retinal nerve fiber layer in very sensitive areas around the optic nerve. Clinical studies have shown that early thinning of the nerve fiber layer precedes vision and visual field loss by 6 years, thus enabling us to diagnose glaucoma at its earliest presentation! Just because someone has glaucoma, does not mean they will go blind! 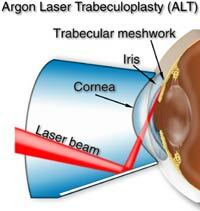 Glaucoma can be treated with drops, lasers and surgery to lower eye pressure. Once the diagnosis is made, most patients are given a prescription and started on eye drops. After a satisfactory eye pressure is achieved, patients are generally seen back in the office every 4-6 months. Our office also practice offers argon laser trabeculoplasty (ALT) using a state of the art Iridex argon laser to treat glaucoma in the office. This painless procedure is covered by all insurances and takes about 15 minutes to perform. If you are interested in more information regarding ALT please ask Dr. Serdahl or Dr.Jones for more information. Occasionally, drops and laser treatments are not successful in controlling eye pressure and a surgery called trabeculectomy is needed. This is done in the operating room and takes 30-45 minutes under local anesthetic. Because this surgery increases patient’s risk for future serious eye infections it is often a last resort for glaucoma patients with serious pressure problems. We check you eye pressure during every eye exam. This is done by placing a drop of flourescein in your eye (a yellow drop with anesthetic) and gently touching the eye with a tonometer. This is the “gold standard” for checking eye pressure. Since corneal thickness can affect the accuracy of tonometry, we may also check your corneal thickness (pachymetry) if we feel that it is necessary. This easy test takes only minutes and is painless!